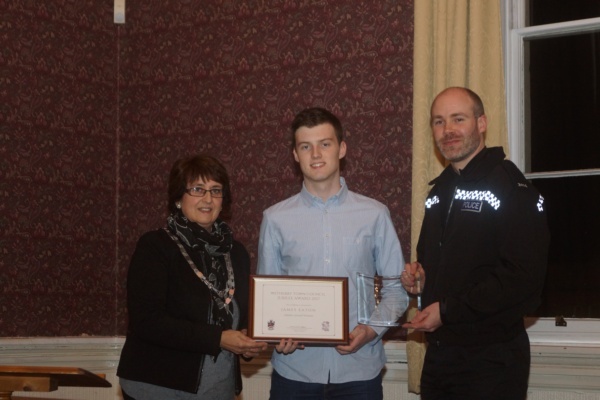 The Council's annual Jubilee Award recognises the achievements of outstanding young people in Wetherby, who are under 20 years of age and who have made an impact, whether nationally, regionally or locally. The award was established in 2012 for the Queen’s Diamond Jubilee and can be awarded jointly to a maximum of three special young persons. Adapting to changes in life style. Kindness beyond the call of duty. The award is a great opportunity for the Council to acknowledge these wonderful young people who do such a lot for the community and, show how proud it is of their achievements. Nominations for the 2019 award can be submitted using the form below. Forms should be returned to the Town Hall by 15th November 2019. Middle (L-R): Jess Prentice, Charles Thompson (Winner), Harry Hemmingway, Jess Scruton, Archie Whitton and Zach Kelley. 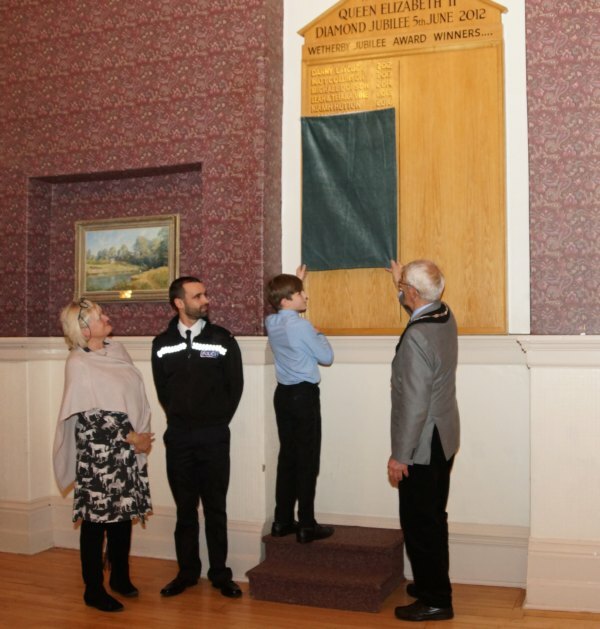 Charles Thompson, 11, has been announced as the 2018 winner of the Town Council’s Jubilee Award. 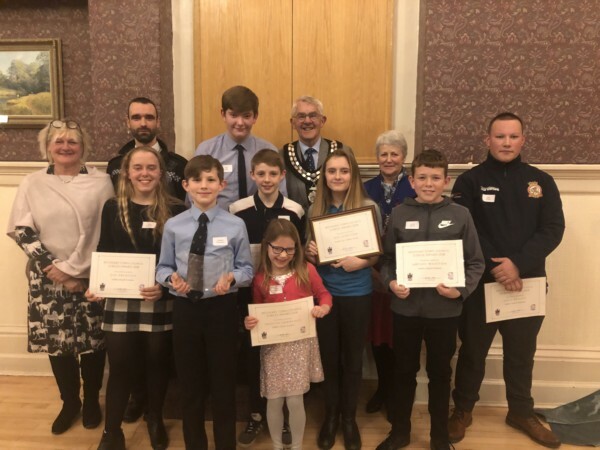 A group of eight very special Wetherby youngsters gathered at the Town Hall last night for the annual Jubilee Award ceremony. The Jubilee Award is presented each year to an individual under the age of 20 who has shown kindness beyond the call of duty, ambition to achieve, carried out work in the community, been brave, adapted to unexpected changes or shown other deserving qualities. After hearing why each of these young people had been nominated by their school teachers or youth group leaders Charles Thompson, age 11 from St. Joseph’s Primary School, was declared a worthy winner. 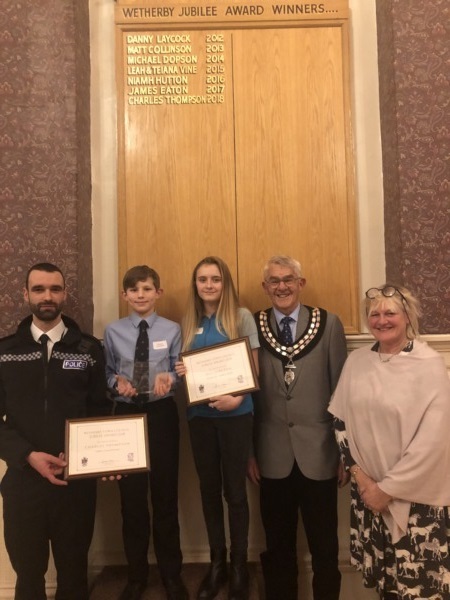 Councillor Galan Moss, Mayor of Wetherby, had headed the panel which considered the nominations and said that it had been “inspiring to learn about the efforts and achievements of these young people”. He also commented that choosing a winner and runner up had been a difficult task for the panel but that Charles’ nomination had stood out because it was about helping other people. “An extraordinary boy who stands out for so many reasons, all of which are rooted in his inherent desire to serve people through his actions. Not only does Charles make a difference in school, in church and in his wider community but he also makes a huge difference at home. Charles is such a caring, sensitive and considerate young man who really does care for everyone! This year’s runner up was Jess Scruton, 15, who helps at East Keswick Guide Unit each week. Jess explained that as well as enjoying helping to organise and provide a wide variety of activities she also acts as a role model setting a good example to the younger girls who attend, helping the unit leaders who had nominated her. Archie Whitton - support for Wetherby High School charity week's fundraising through participation is all three events of a mini-triathlon. Ben Cole - A regular volunteer and coach at the Lower Wharfe Canoe Club. Harry Hemmingway - Success as the 2018 Junior European Trials Bike Champion. Imogen Lawrence - A brave and resilient 6 year old who is a role model for others who are facing difficult times and shows the importance of mental health awareness and support. Jess Prentice - Sporting achievements and participation at both and local level and membership of the Air Cadets. Zach Kelley - A positive role model, involved in extra-curricular activities and a principle member of the Air Cadets. The 2018 Winner (Charles Thompson) and runner up (Jess Scruton) with the presentation party.